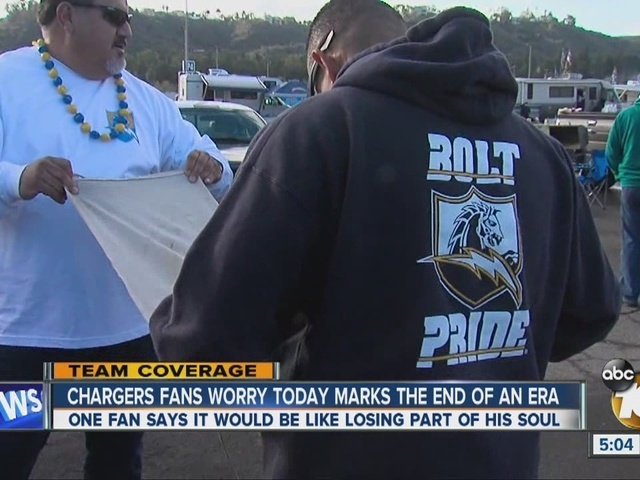 SAN DIEGO -- Chargers fans worried Sunday could mark the end of their long-time tailgating tradition. One group that calls itself "Bolt Pride" has occupied the same space in section A-4 for more than 20 years. But, this year may have been their last. "For us, not to have this anymore, is like a lost part of my soul," said Derrick Turner. Turner is a nine-year ticket holder. He worries the Chargers will leave San Diego. "I mean, coming over here, the drive was like so surreal, almost like a bad movie was ending." Chargers fan Rafael Alvarez has had Chargers season tickets since 1992 -- the same year his daughter was born. "Right here, life is even more special," Alvarez said. So what happens if the Chargers do go to Carson? "I feel like I'm going to turn my back on them," said Turner. "You know what, time heals everything. If they do move and they start winning, because winning cures everything, maybe I'll follow them a little bit." Turner says he'll miss the people and the fun times they shared together. "We feel cheated on, but we're still here and that's what's so funny about it. I feel cheated on but guess what, I'm still here," said Turner.